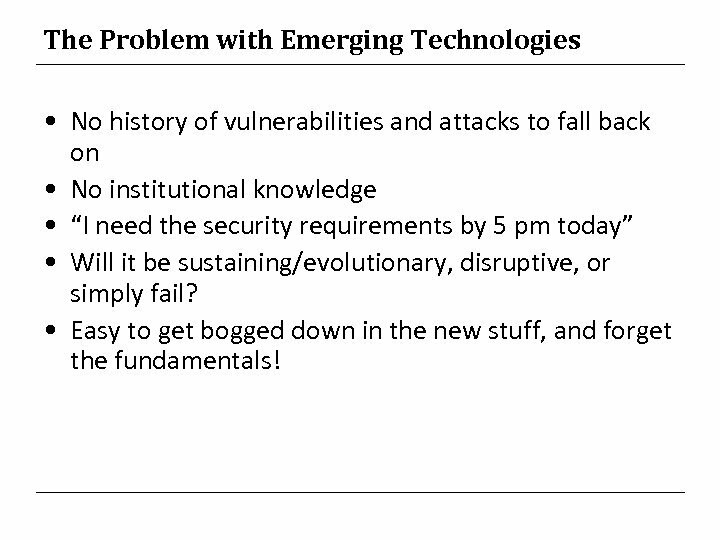 The Problem with Emerging Technologies • No history of vulnerabilities and attacks to fall back on • No institutional knowledge • “I need the security requirements by 5 pm today” • Will it be sustaining/evolutionary, disruptive, or simply fail? 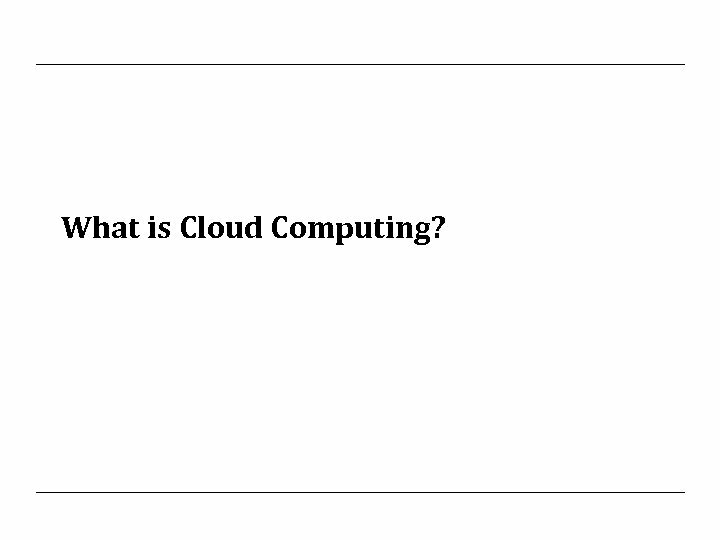 • Easy to get bogged down in the new stuff, and forget the fundamentals! 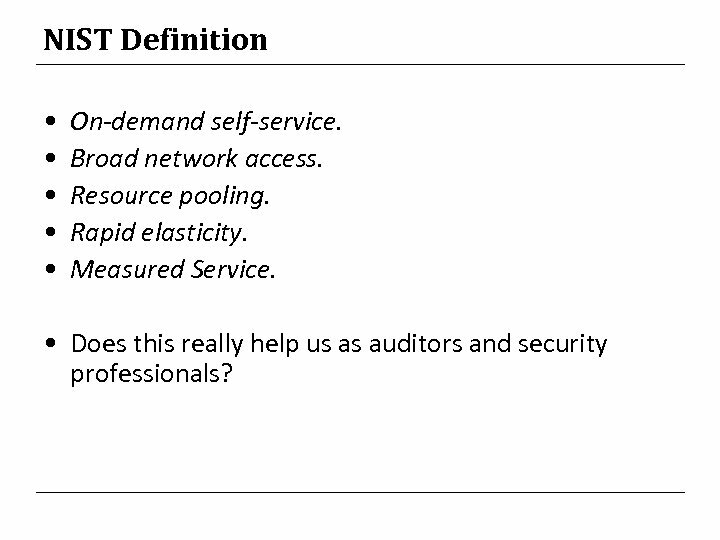 NIST Definition • • • On-demand self-service. 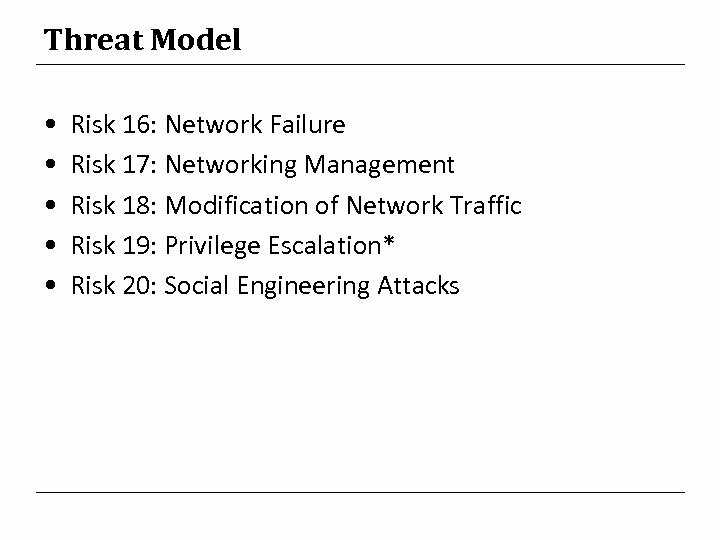 Broad network access. 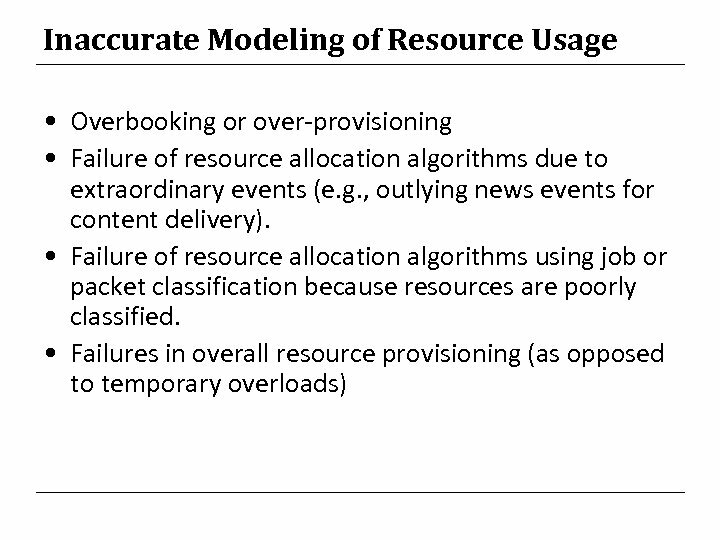 Resource pooling. 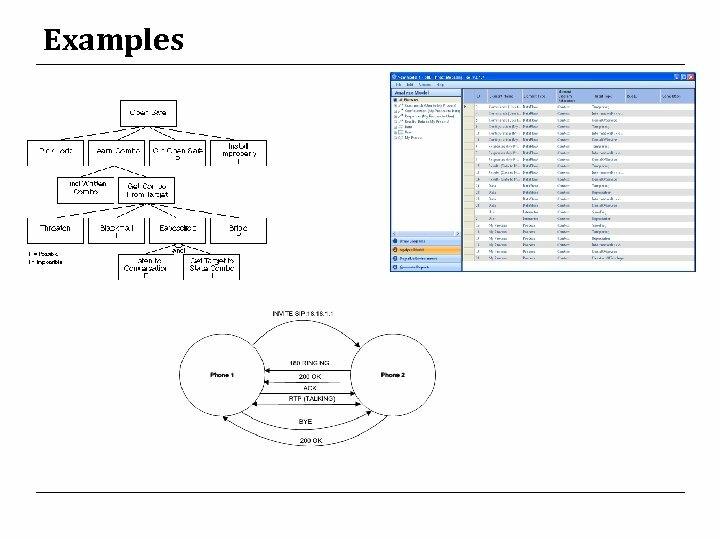 Rapid elasticity. 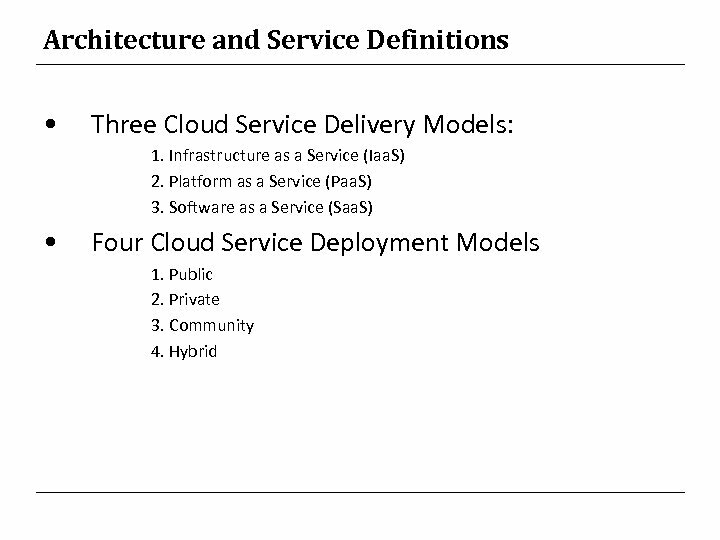 Measured Service. 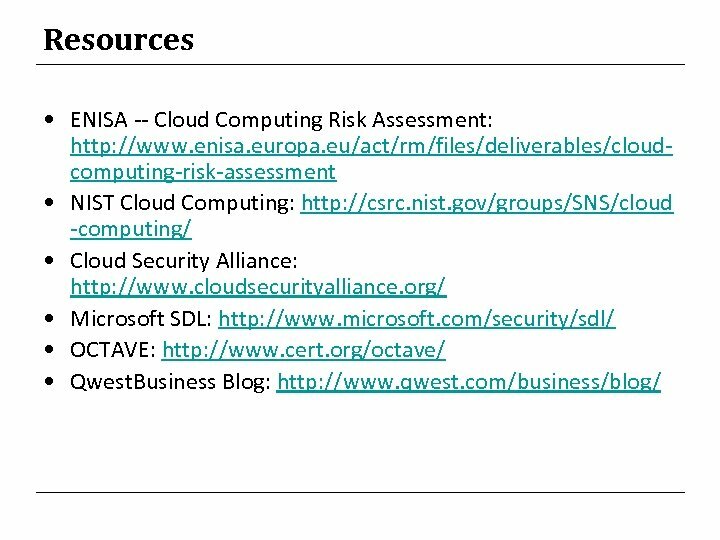 • Does this really help us as auditors and security professionals? 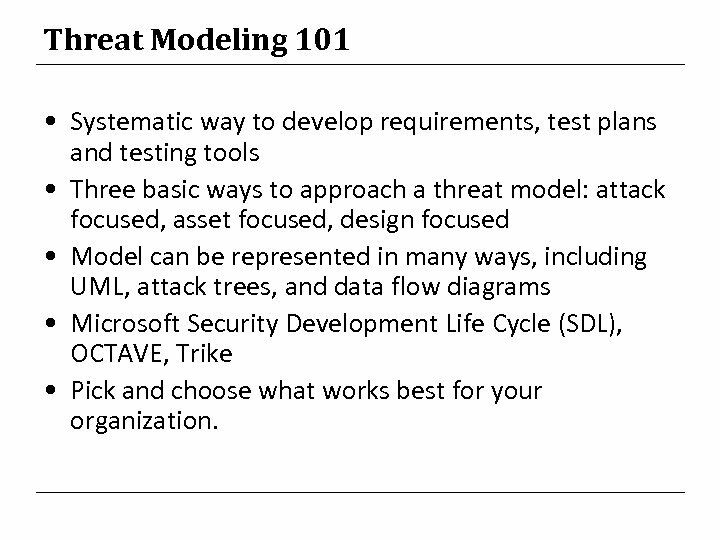 Threat Modeling 101 • Systematic way to develop requirements, test plans and testing tools • Three basic ways to approach a threat model: attack focused, asset focused, design focused • Model can be represented in many ways, including UML, attack trees, and data flow diagrams • Microsoft Security Development Life Cycle (SDL), OCTAVE, Trike • Pick and choose what works best for your organization. 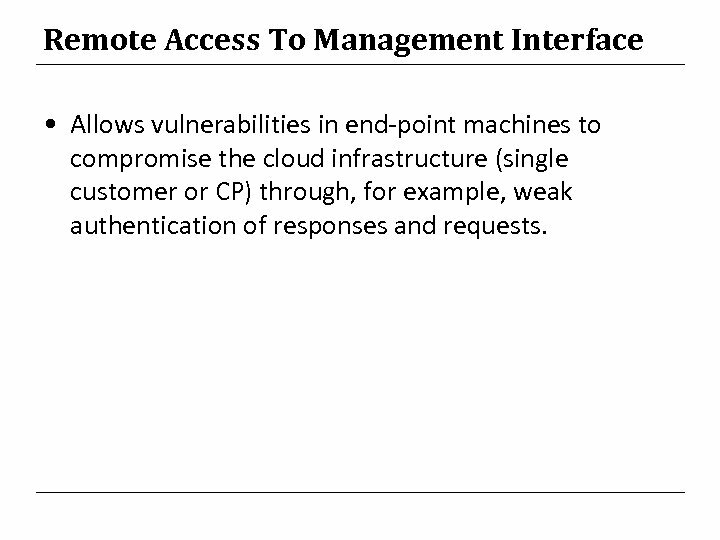 Remote Access To Management Interface • Allows vulnerabilities in end-point machines to compromise the cloud infrastructure (single customer or CP) through, for example, weak authentication of responses and requests. 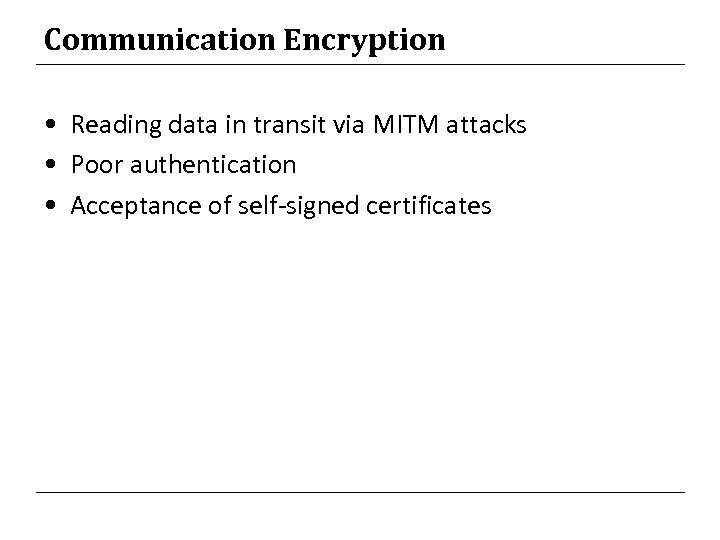 Unable to Process Data in Encrypted Form • Encrypting data at rest is easy, but implementing homomorphic encryption is not -- there is little prospect of any commercial system being able to maintain data encryption during processing. 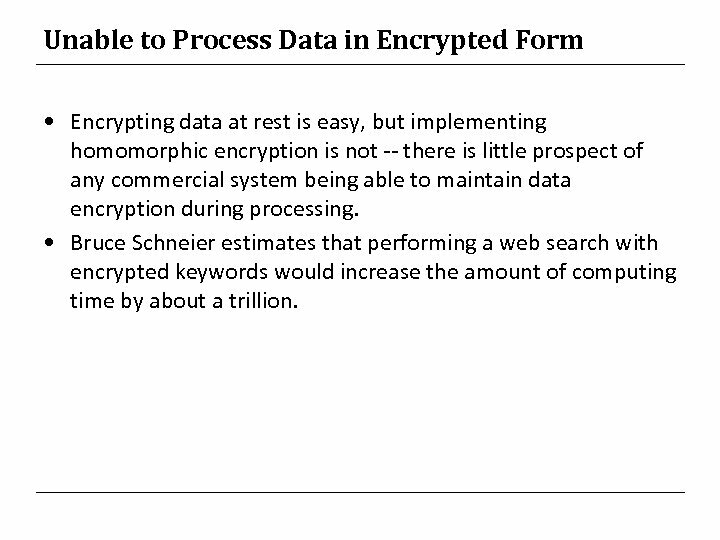 • Bruce Schneier estimates that performing a web search with encrypted keywords would increase the amount of computing time by about a trillion. 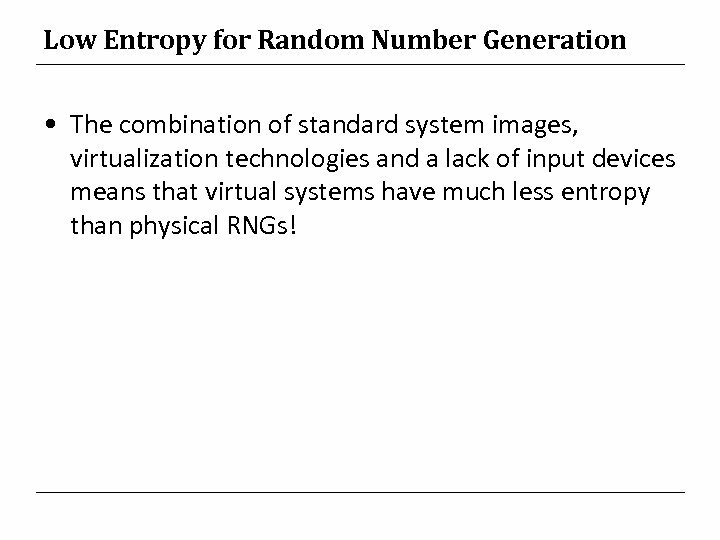 Low Entropy for Random Number Generation • The combination of standard system images, virtualization technologies and a lack of input devices means that virtual systems have much less entropy than physical RNGs! 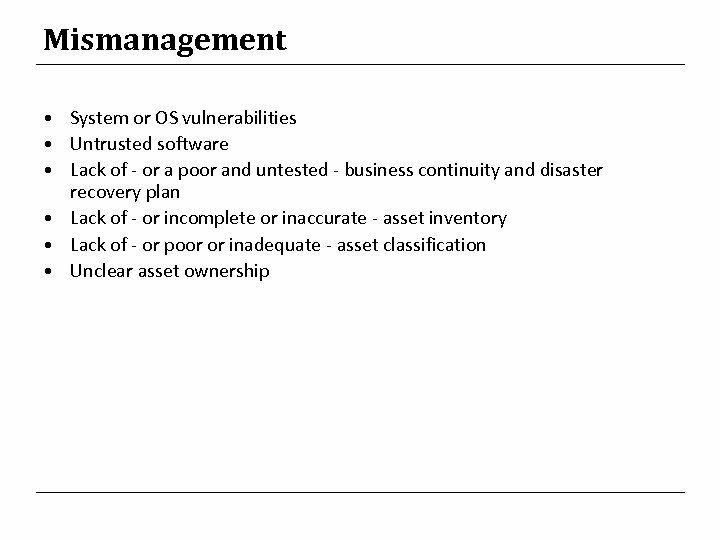 No Control of Vulnerability Assessment Process • Restrictions on port scanning and vulnerability testing are an important vulnerability which, combined with a AUP which places responsibility on the customer for securing elements of the infrastructure, is a serious security problem. 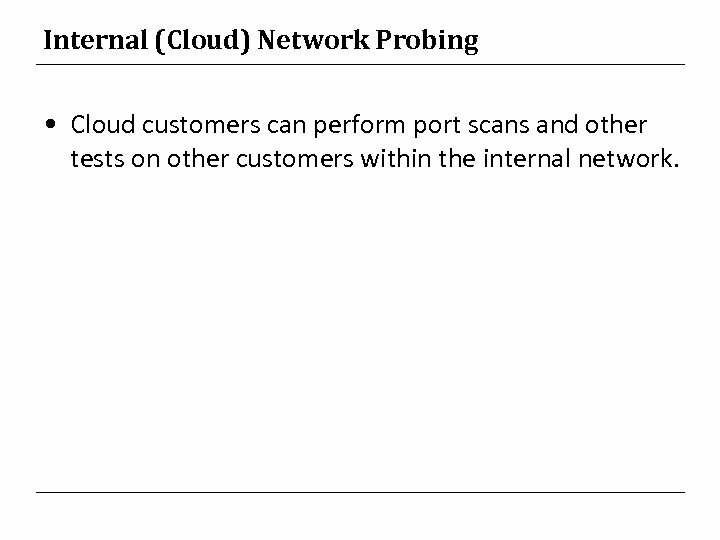 Internal (Cloud) Network Probing • Cloud customers can perform port scans and other tests on other customers within the internal network. 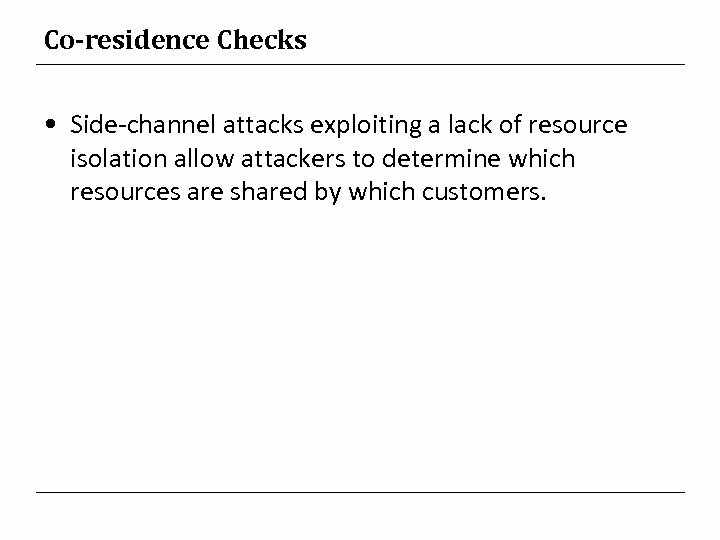 Co-residence Checks • Side-channel attacks exploiting a lack of resource isolation allow attackers to determine which resources are shared by which customers. 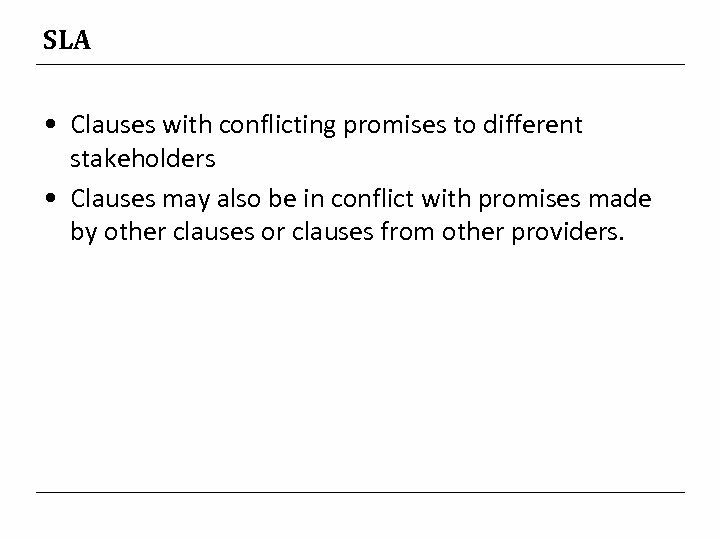 SLA • Clauses with conflicting promises to different stakeholders • Clauses may also be in conflict with promises made by other clauses or clauses from other providers. 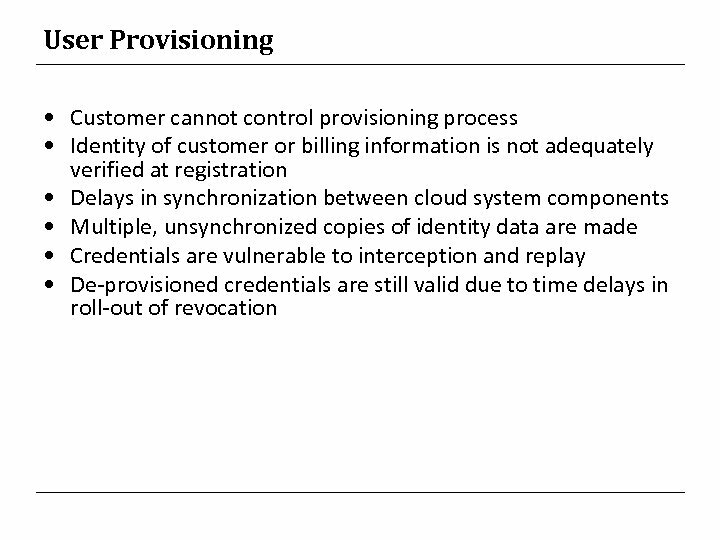 Audit or Certification Not Available to Customers • The CP cannot provide any assurance to the customer via audit certification. 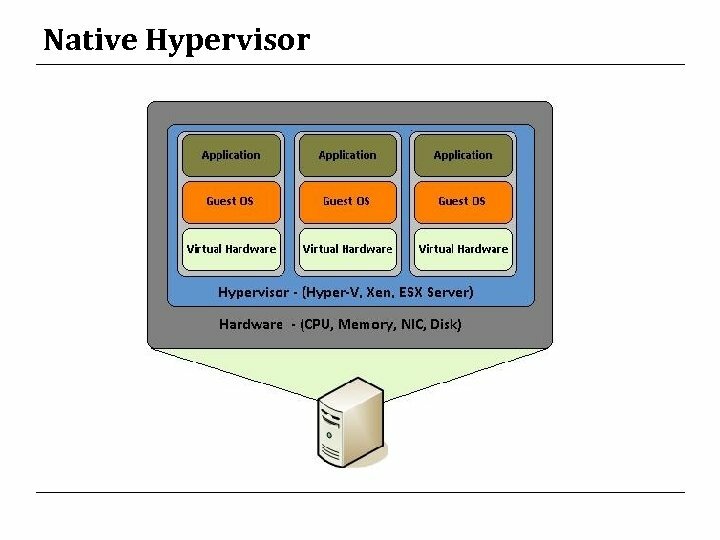 • Open source hypervisors or customized versions of them (e. g. , Xen) may not have Common Criteria certification, etc. 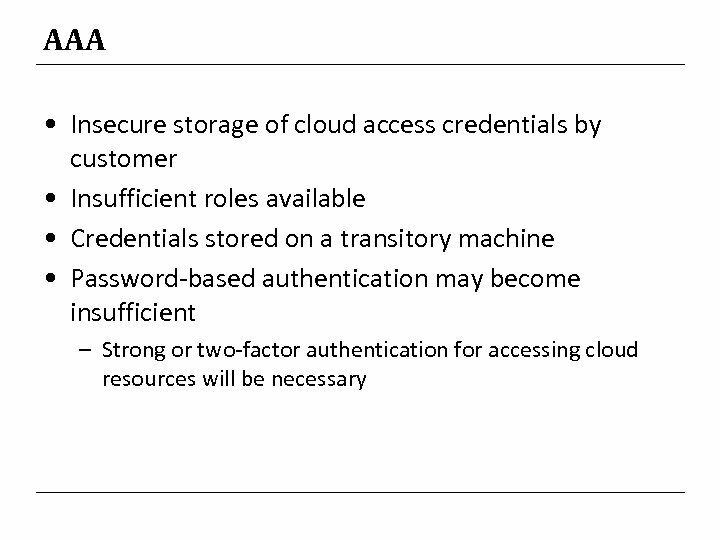 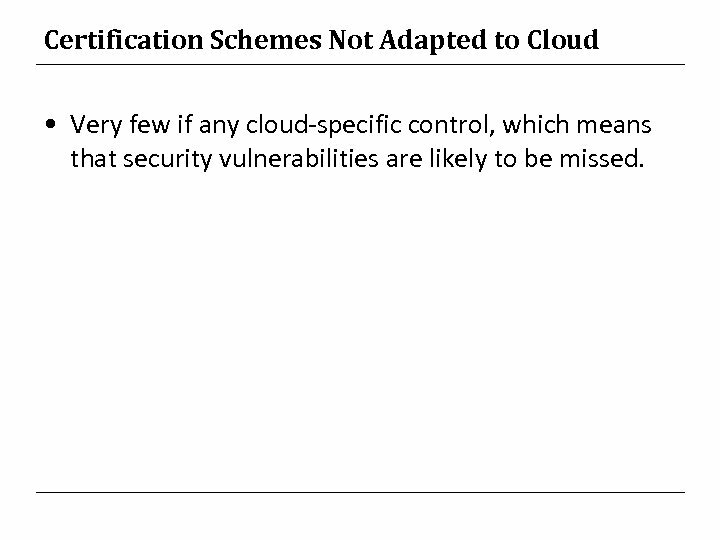 Certification Schemes Not Adapted to Cloud • Very few if any cloud-specific control, which means that security vulnerabilities are likely to be missed. 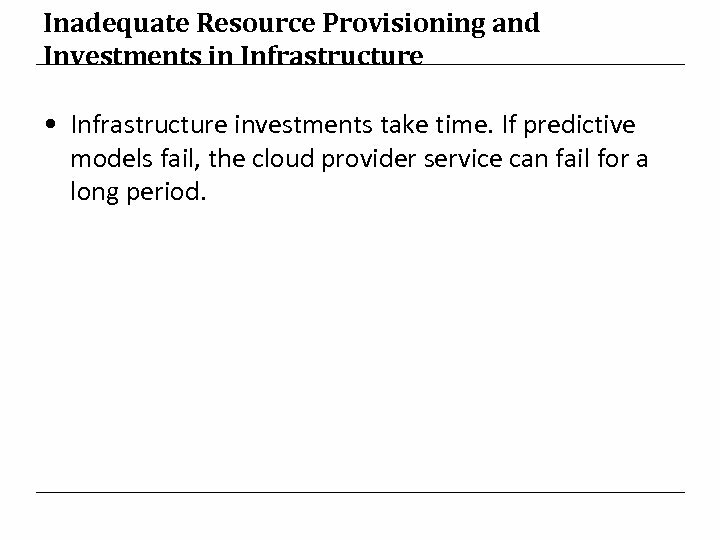 Inadequate Resource Provisioning and Investments in Infrastructure • Infrastructure investments take time. 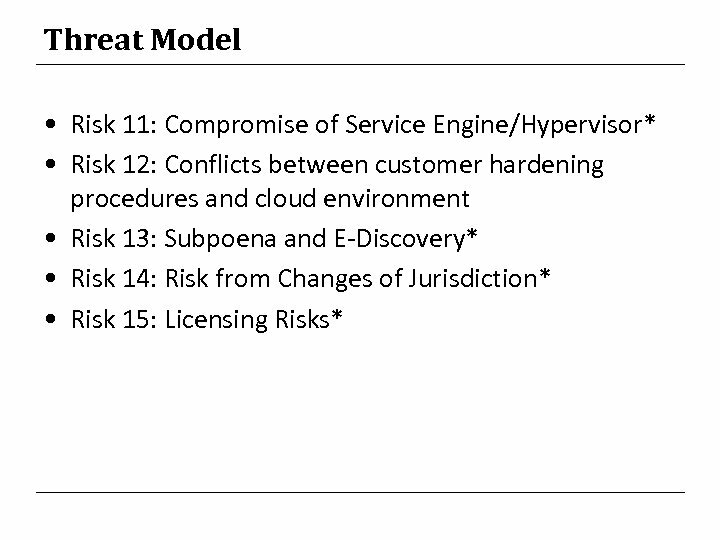 If predictive models fail, the cloud provider service can fail for a long period. 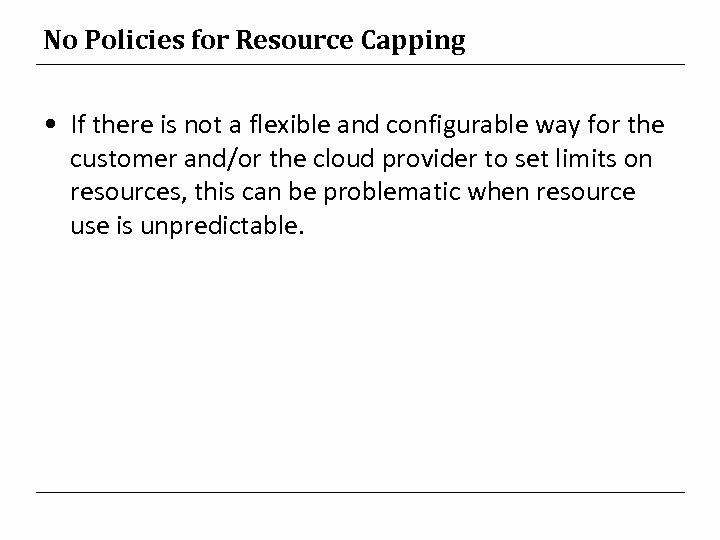 No Policies for Resource Capping • If there is not a flexible and configurable way for the customer and/or the cloud provider to set limits on resources, this can be problematic when resource use is unpredictable. 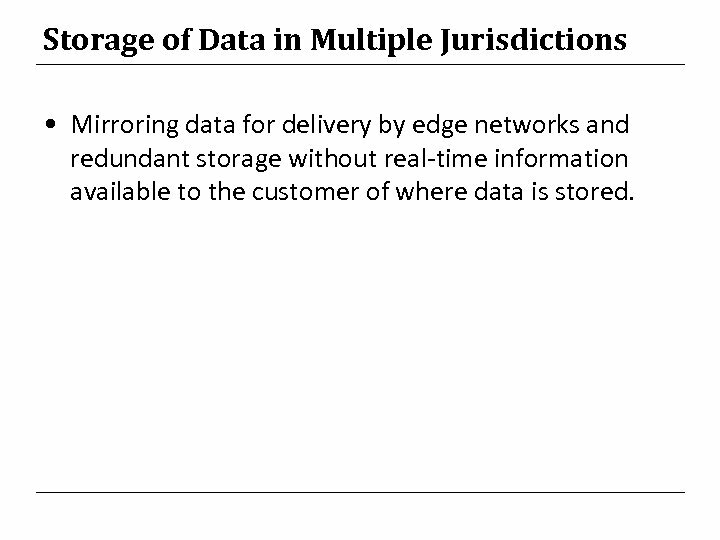 Storage of Data in Multiple Jurisdictions • Mirroring data for delivery by edge networks and redundant storage without real-time information available to the customer of where data is stored. 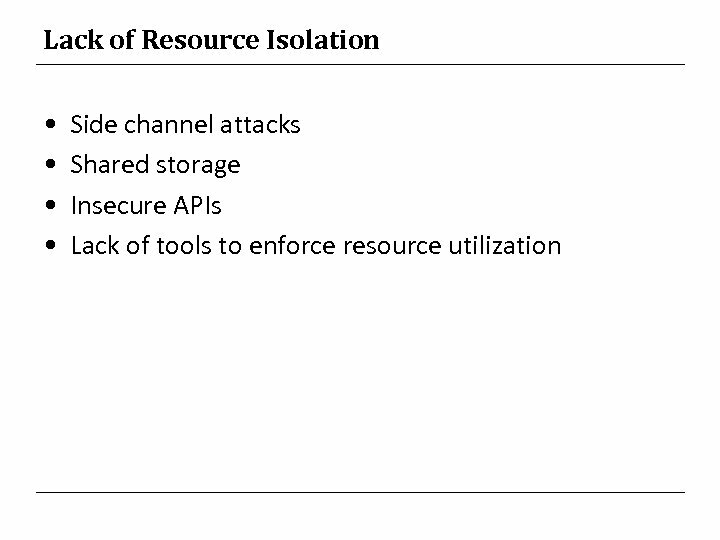 Lack of Information on Jurisdictions • Data may be stored and/or processed in high risk jurisdictions where it is vulnerable to confiscation by forced entry. 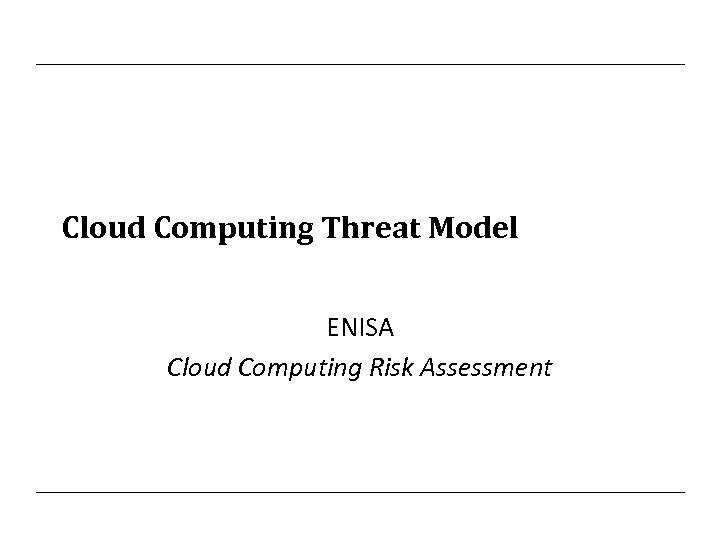 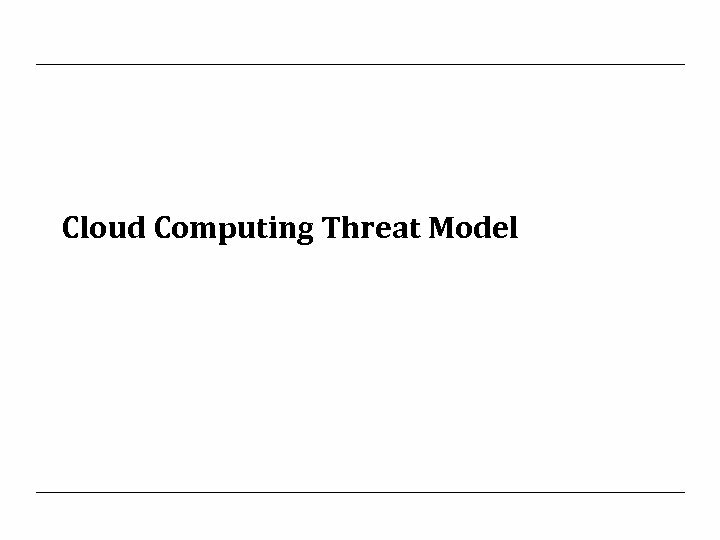 Lack of Cloud Security Awareness • Cloud customers and providers are not aware of the risks they could face when migrating into the cloud, particularly those risks that are generated from cloud specific threats, i. e. loss of control, vendor lock-in, exhausted CP resources, etc. 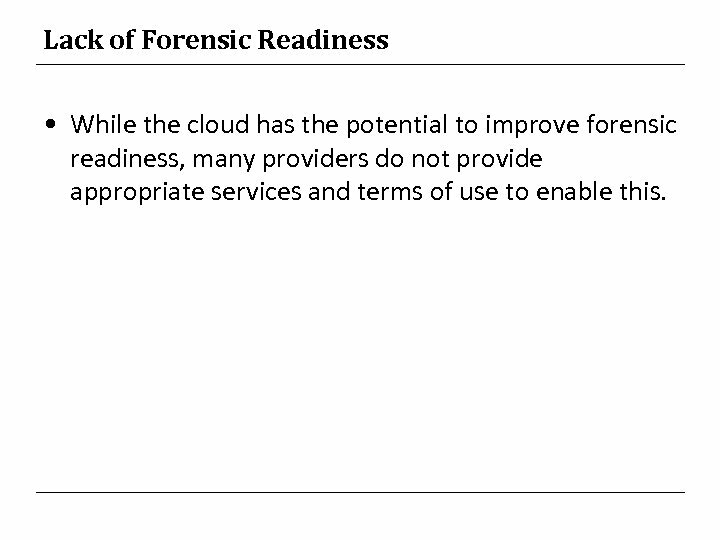 Lack of Vetting Processes • Since there may be very high privilege roles within cloud providers, due to the scale involved, the lack or inadequate vetting of the risk profile of staff with such roles is an important vulnerability. 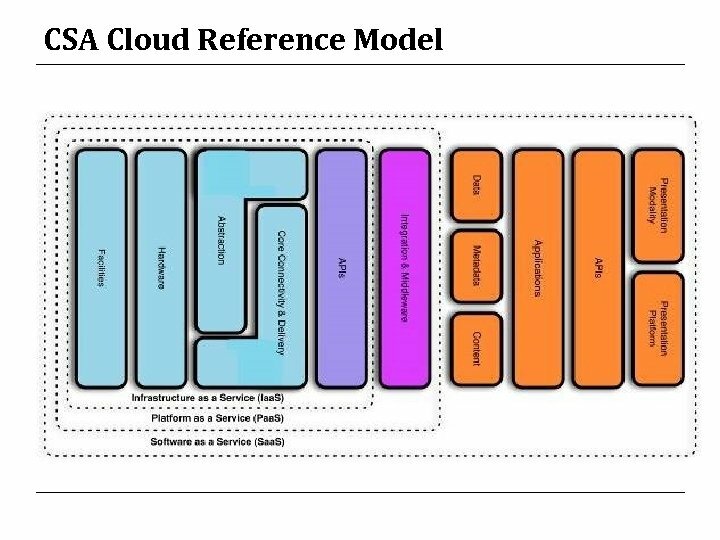 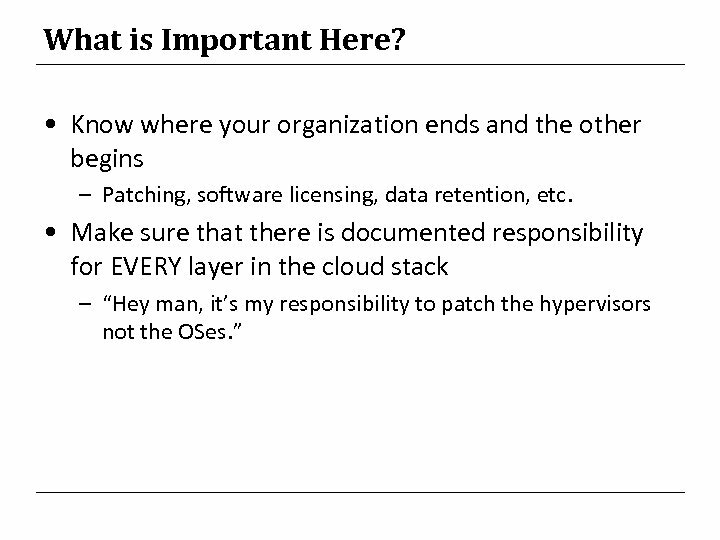 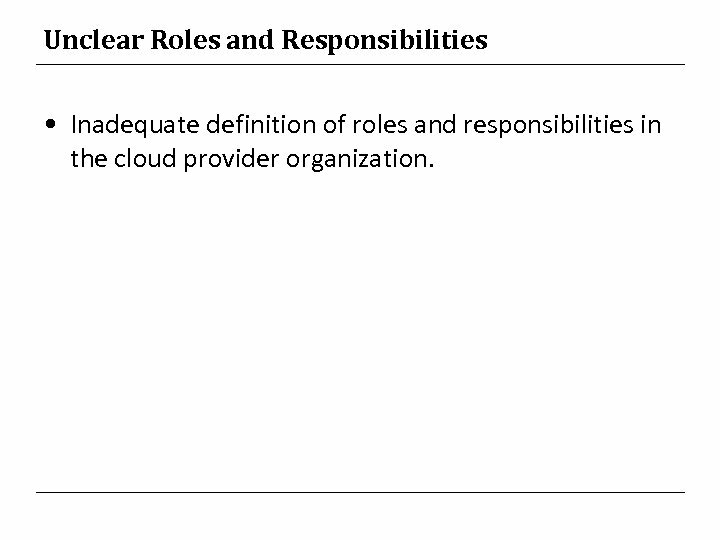 Unclear Roles and Responsibilities • Inadequate definition of roles and responsibilities in the cloud provider organization. 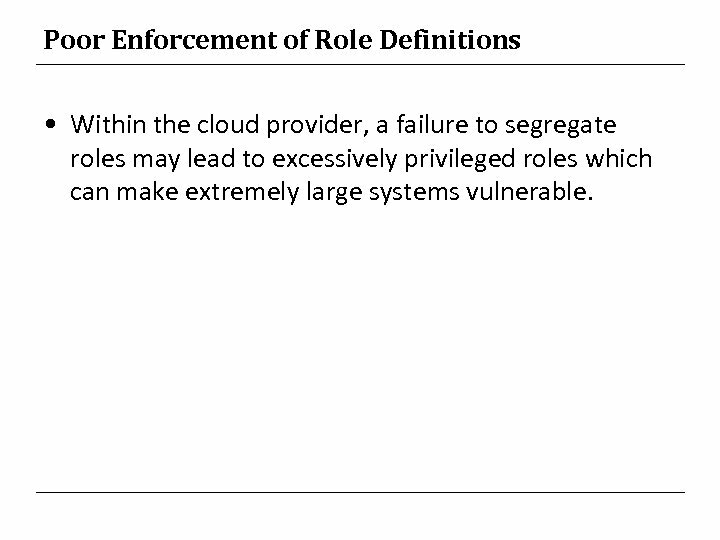 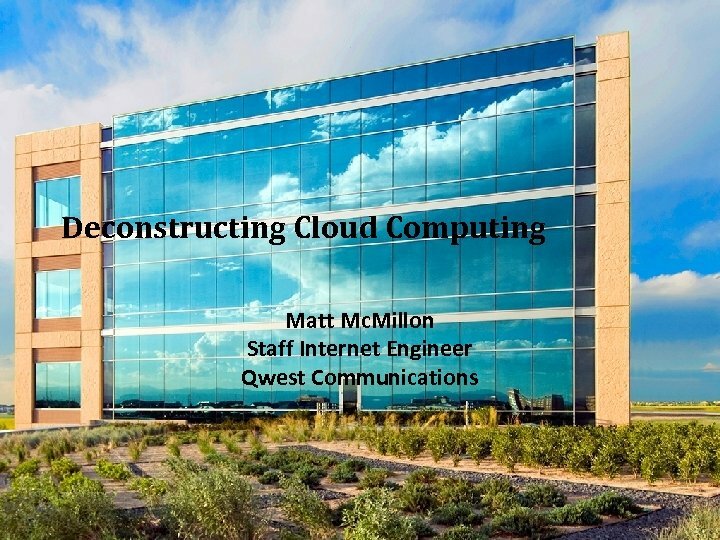 Poor Enforcement of Role Definitions • Within the cloud provider, a failure to segregate roles may lead to excessively privileged roles which can make extremely large systems vulnerable. 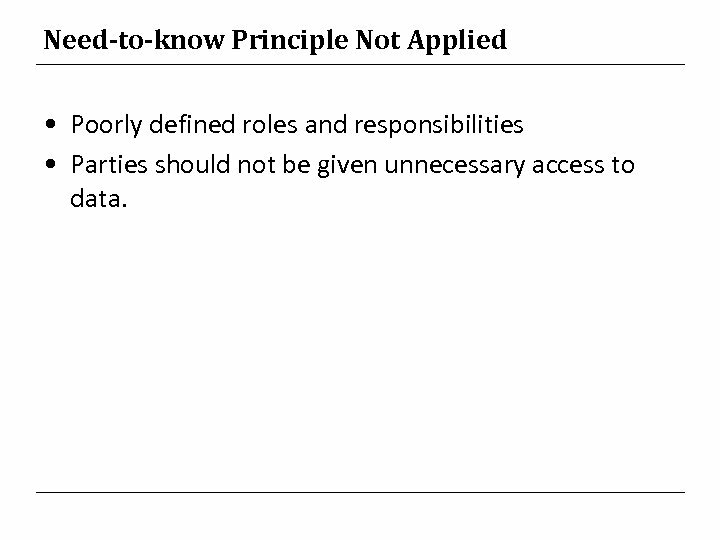 Need-to-know Principle Not Applied • Poorly defined roles and responsibilities • Parties should not be given unnecessary access to data. 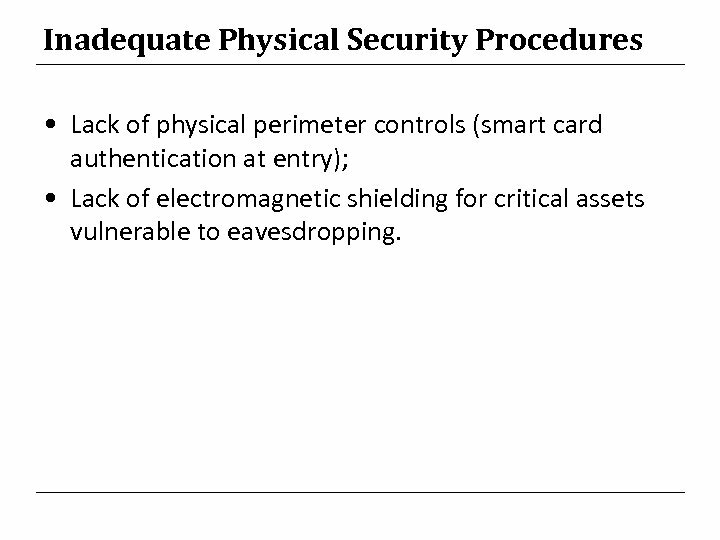 Inadequate Physical Security Procedures • Lack of physical perimeter controls (smart card authentication at entry); • Lack of electromagnetic shielding for critical assets vulnerable to eavesdropping. 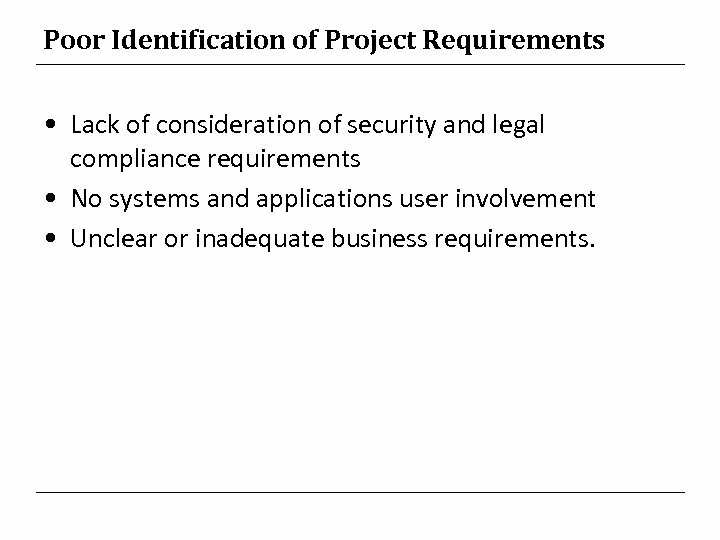 Poor Identification of Project Requirements • Lack of consideration of security and legal compliance requirements • No systems and applications user involvement • Unclear or inadequate business requirements.